For the past 3 years, precious metals have managed to achieve outstanding performance. Many analysts have predicted year 2012 will be another good year for investors. As part of basic materials sector, precious metals include gold, silver, platinum, palladium, etc. To invest in these precious metals, investor can choose mutual funds. 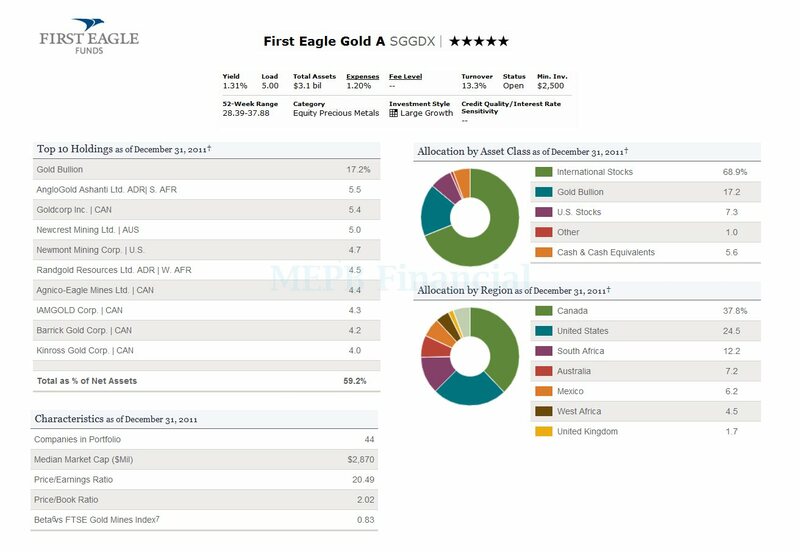 One of the top equity precious metals funds is First Eagle Gold fund. The investment objective of First Eagle Gold fund is to provide long-term growth of capital by investing in gold investment for a portion of their overall portfolio. This equity fund typically invests majority of total assets (>80%) in gold or stocks directly related to gold or companies mainly engaged in the gold industry. It may invest <20% of assets in equity and, to a limited extent, debt securities unrelated to gold or the gold industry. This fund is considered as a non-diversified mutual fund. The fund’s managers are Rachel Benepe and Chris Kwan, CFA. It has an expense ratio of 1.22%. The total net assets are $3.1 Billion. This top equity precious metals fund has a yield of 1.31%. The annual holding turnover rate is 13%. This turnover rate is lower than the average category of 100%. The 3 years beta of this sector stock fund is 0.83 (against FTSE Gold Mines Index). There is 0.25% 12b1 fee and 5% front-end sales load fee. To invest in this First Eagle fund, you will need $2,500 for the minimum initial investment in brokerage account and $1,000 for tax deferred IRA account. This best precious metals fund is widely available from 93 brokerages such as UBS Financial Services Inc, Ameriprise Brokerage, Morgan Stanley SB, Sterne, Agee & Leach, Inc., Trade PMR Transaction Fee, Fidelity Retail FundsNetwork, Edward Jones, etc. Although it returned -11.13% for year 2011, this top rated fund is ranked in top 2% against its category for 2011. This fund is rated 5 stars rating by Morningstar. Based on load adjusted return, this sector equity fund has returned -15.57% over the past year, 16.53% over the past 3 years, 10.87% over the past 5 years, and 21.52% over the past 10 years. As this class A fund has a sales load, you can find Other classes are Class C (FEGOX), and Class I (FEGIX). The FEGIX fund (First Eagle Gold I) doesn’t have any sales load. It also has an expense ratio of 0.97%. The minimum initial investment is $1 million. As of January 2012, the top 10 holdings are Gold Bullion (17.2%), AngloGold Ashanti Ltd. ADR (5.5%), Goldcorp Inc. (5.4%), Newcrest Mining Ltd (5%), Newmont Mining Corp. (4.75%), Randgold Resources Ltd. ADR (4.5%), Agnico-Eagle Mines Ltd. (4.4%), IAMGOLD Corp. (4.3%), Barrick Gold Corp. (4.2%), and Kinross Gold Corp. (4%). The total as % of net assets of these top 10 holdings is 59.2%. Top 5 asset classes of this best equity precious metals fund is International Stocks (68.9%), Gold Bullion (17.2%), U.S. Stocks (7.3%), Cash (5.6%), and other (1%).